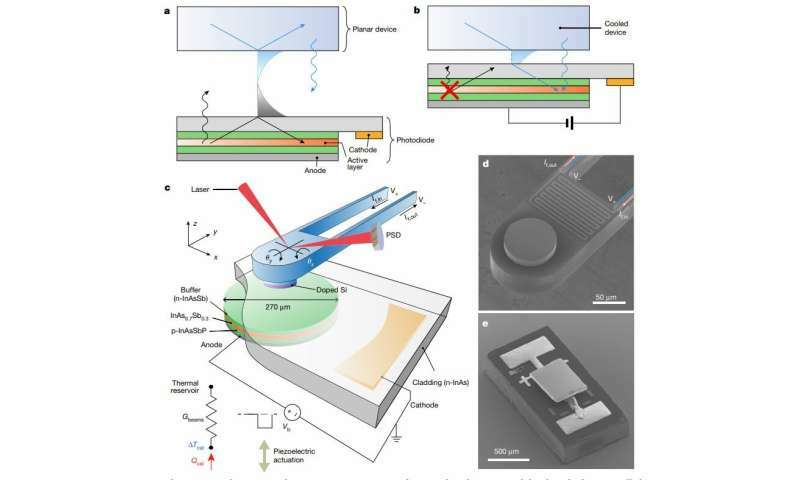 "We have demonstrated a second method for using photons to cool devices," said Pramod Reddy, who co-led the work with Edgar Meyhofer, both professors of mechanical engineering. The first—known in the field as laser cooling—is based on the foundational work of Arthur Ashkin, who shared the Nobel prize in Physics in 2018. The researchers instead harnessed the chemical potential of thermal radiation—a concept more commonly used to explain, for example, how a battery works. "Even today, many assume that the chemical potential of radiation is zero," Meyhofer said. "But theoretical work going back to the 1980s suggests that under some conditions, this is not the case." The chemical potential in a battery, for instance, drives an electric current when put into a device. Inside the battery, metal ions want to flow to the other side because they can get rid of some energy—chemical potential energy—and we use that energy as electricity. Electromagnetic radiation, including visible light and infrared thermal radiation, typically does not have this type of potential. "Usually for thermal radiation, the intensity only depends on temperature, but we actually have an additional knob to control this radiation, which makes the cooling we investigate possible," said Linxiao Zhu, a research fellow in mechanical engineering and the lead author on the work. That knob is electrical. In theory, reversing the positive and negative electrical connections on an infrared LED won't just stop it from emitting light, but will actually suppress the thermal radiation that it should be producing just because it's at room temperature. "The LED, with this reverse bias trick, behaves as if it were at a lower temperature," Reddy said. However, measuring this cooling—and proving that anything interesting happened—is hideously complicated. To get enough infrared light to flow from an object into the LED, the two would have to be extremely close together—less than a single wavelength of infrared light. This is necessary to take advantage of "near field" or "evanescent coupling" effects, which enable more infrared photons, or particles of light, to cross from the object to be cooled into the LED. Reddy and Meyhofer's team had a leg up because they had already been heating and cooling nanoscale devices, arranging them so that they were only a few tens of nanometers apart—or less than a thousandth of a hair's breadth. At this close proximity, a photon that would not have escaped the object to be cooled can pass into the LED, almost as if the gap between them did not exist. And the team had access to an ultra-low vibration laboratory where measurements of objects separated by nanometers become feasible because vibrations, such as those from footsteps by others in the building, are dramatically reduced. "Any object that is at room temperature is emitting light. A night vision camera is basically capturing the infrared light that is coming from a warm body," Meyhofer said. The team demonstrated cooling of 6 watts per meter squared. Theoretically, this effect could produce cooling equivalent to 1,000 watts per meter squared, or about the power of sunshine on Earth's surface. The research is to be published in the journal Nature on Feb. 14, 2019, titled, "Near-field photonic cooling through control of the chemical potential of photons." Feels like an April 1 product announcement for Dark Emitting Diodes (DED) in one of the old EE magazines I used to read. Pretty neat if they can make this into a practical cooling method. If they are acting as a heat sink, they are not increasing the heat concentration. If I understand this correctly, the LEDs are reverse-biased, blocking current flow. (If they were forward biased, with sufficient voltage and current, they would be conducting and emitting both light and heat.) So at best, there would only be a minuscule leakage current. I wonder if that leakage current increases as a function of carrying heat away?